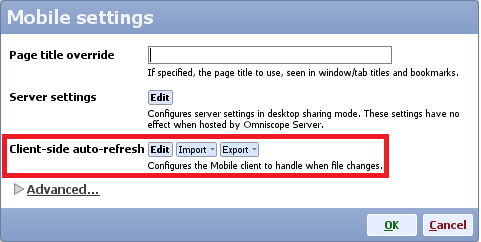 In the latest version of Omniscope 2.9 we have made improvements to what happens when the server IOK file is updated while a client is browsing it. These changes make it easier for you to collaborate or create a continuously updating dashboard. Depending on the kind of change, the client may be able to continue interacting, or be forced to reload (refresh the browser). Changes that force a reload include adding/deleting records/fields. Changes that don't force a reload include adding/removing views/tabs. 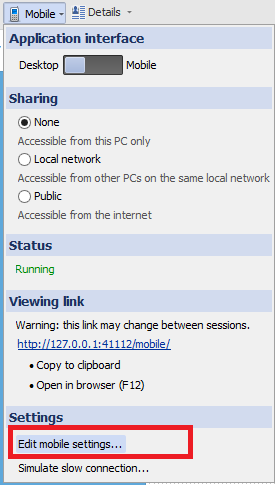 You will then be prompted with different settings you can persist in the IOK regarding Mobile. 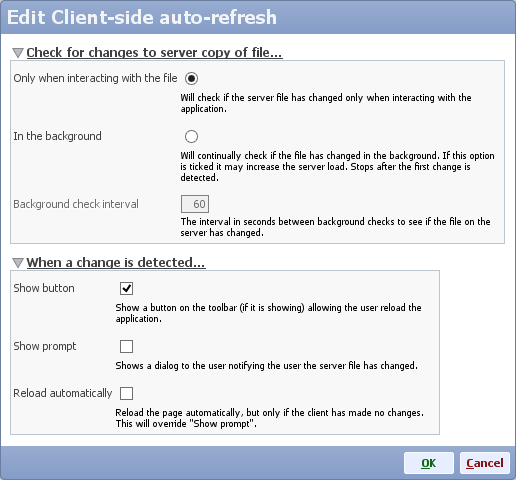 Click Edit alongside Client-side auto-refresh. This section defines when the file on the server is checked to see if it has changed. The check will happen only when the user is actively interacting with the file e.g. when switching tabs or adjusting filters. The check will happen periodically, in the background, while the client has the page open. 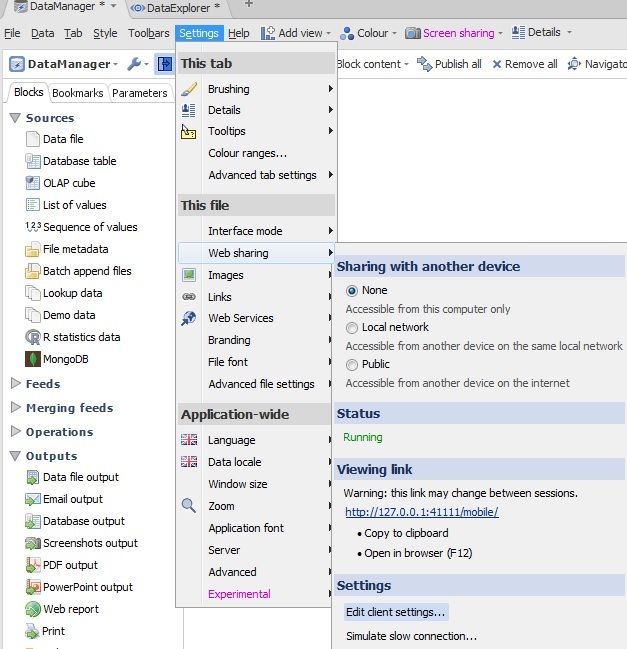 Note: this option may increase server load because the file would remain in server memory. For large files on shared servers this would prevent inactive apps from being unloaded from server memory, ultimately reducing performance in extreme cases. 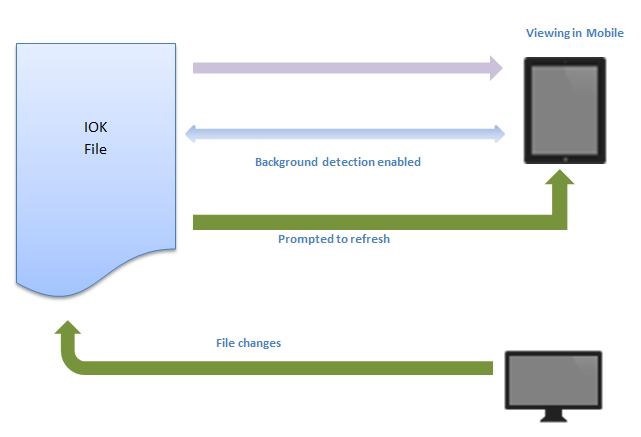 This section defines what happens when the client detects the file on the server has changed. If ticked, a lighting flash icon will appear on the main toolbar of the client (if the toolbar is showing). Clicking it will reload the application. If ticked, a prompt will be shown explaining what has happened. Depending on the change, the user could choose to continue working on the session. If ticked, the client will automatically reload immediately to show the new changes, but only if the user has not made any client-side changes of their own such as filtering, selection or view menus. You should tick this option for a live-updating dashboard.